Just as the ancient art of kintsugi elevates broken objects, here, reclaiming worn and damaged items is celebrated as a form of art. - Taiwanese artist Wu Yu Jung "performs" mending on clothing. This video captures his time at the San Jose Museum of Quilts and Textiles. - Some artists, such as quilter Heidi Parkes, include mending as a sideline. - A few document repairs in their art, such as Tony May in his acrylic painting (at left) from 2003. - Some artists cleverly and playfully mend, patch, and repair items without calling it art, as in Janet Burdick's appliqué below. 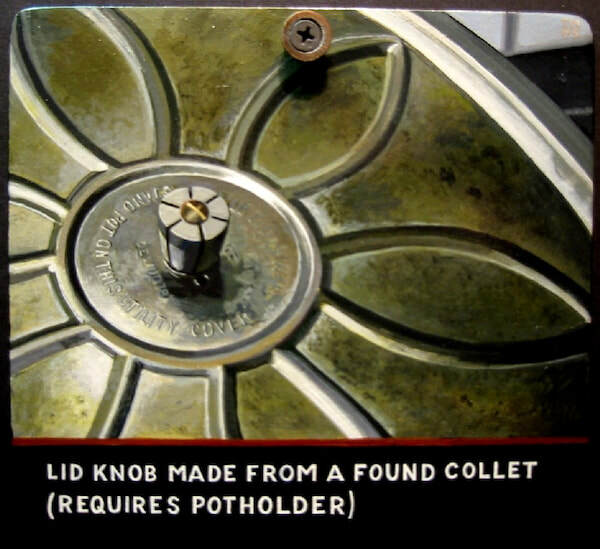 - Many other people artfully repair and reclaim household items,. An example is the pant leg above, patched (at the knee) by Charles Pioli, a master builder in Salt Lake City. 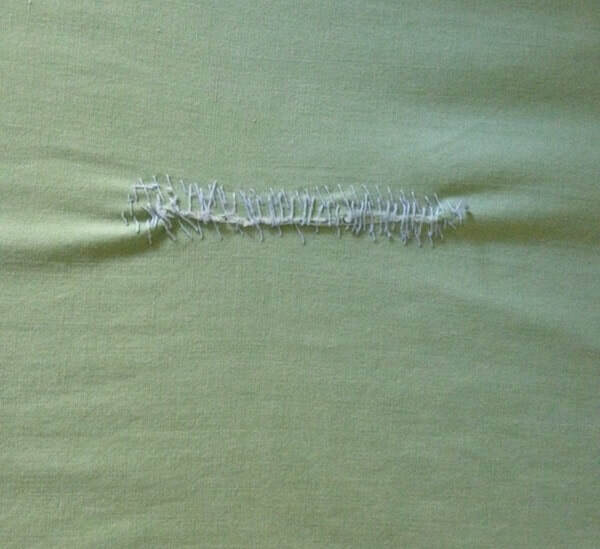 I mended this sheet after it was torn on a sharp angle of the fold-out bed used by my sister when she visited with her second husband in the early 1980s. Mend by Anna Koster; sheet used in the years since. I noticed appliqué​ dots on this pillow case while housesitting for artists Janet Burdick and Scott Miller. Curious, I discovered a small stain under one of the dots; the other is there to create balance and keep the first dot company. Patches by Janet Burdick. 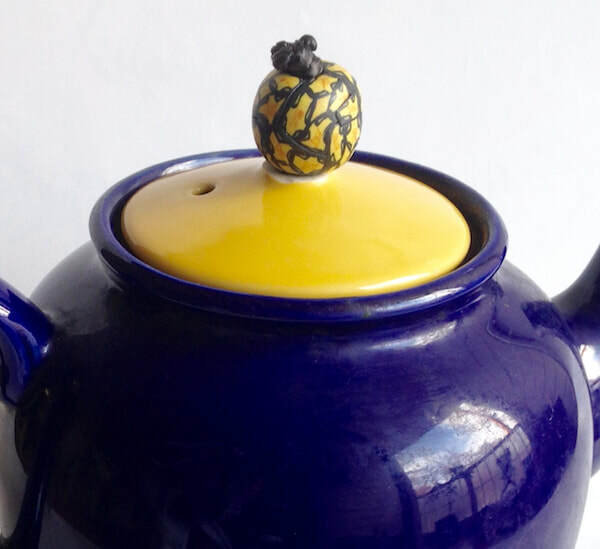 The teapot sports a handmade bead, which replaces the knob that was shattered when the lid fell to the floor. Repair made by me, Anna Koster, 2019. Here, we elevate the lowly tasks of reclaiming items that are damaged or worn. With mindfulness, we can refocus our too-busy lives in this single-use-throw-away culture as we apply the healing arts of mending, patching, and repairing. The Japanese aesthetic of wabi-sabi is consistent with the mending movement promoted here.